For a century or more, a pilgrimage of death saw thousands of English consumptives making their painful journey to Pan, a small French town in the shadow of the Pyrenees. Here, they believed, a climate of tranquillity could free them from a disease that already had them by the throat. The winter trees in Pan might tremble, but they would never shake. The town was calm, its gardens handsome, its air as still as a shroud. To generations raised in the belief that wind, chill and the bustle of cities were the enemies to be avoided, Pan represented hope. It is easy to mock the false expectations, but impossible not to be moved by the hopes that Pan inspired. Tuberculosis was a terror without class distinction. Nobody knew how it was caused, how it chose its victims. When a lifebelt is nowhere to be found, grasping at a straw makes a kind of sense. Professor Charles Louis, France's leading TB expert in the 1840s, married late. When TB struck down his only son, Louis gave up his career and went to live with him in Pan. He did not believe that a change of climate could effect a cure, and never changed his mind. But he went on hoping against belief, a mental contortion of the kind TB imposed even upon the most rational. His son soon died. 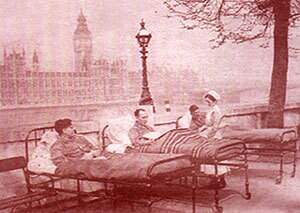 In the first half of the 19th Century there was hardly a person in London who was not infected with TB. But while infection was universal, the disease was not. Even though it was the principal cause of death in Europe and much of North America, its incidence had an arbitrariness that puzzled even the cleverest physicians. We now know that TB is caused by a bacillus, a rod-shaped bacterium first isolated by the German Robert Koch in 1882. But not all those who carry the bacillus develop the disease. In an era when everybody was exposed to TB it was perfectly sensible to believe that the disease was hereditary, since what determines illness in such circumstances is genetics. If everybody carries a germ but only a proportion succumb, then it is the genes that pick losers from winners. In 1837 the English physician Sir James Clerk listed "improper diet, impure air, deficient exercise, excessive labour, imperfect clothing, want of cleanliness, abuse of spirituous liquors, mental causes and contagion" as the causes of consumption. The germ came last in Sir James' catalogue. His contemporary, the American physician William Beach, dismissed contagion altogether, emphasising instead hereditary disposition" marked by such features as a narrow chest or prominent shoulders. Beach recommended travel, sending a few more American consumptives to the grand hotels of Pan and others to Brazil and the West Indies. Beach was wrong, but so perhaps were those who saw Koch's discovery as "the last word on the subject". The historiography of TB is split by a long-running and fascinating dispute over how it came to be conquered, a dispute that is of more than merely historical interest now that TB is on the march again. If the bacillus is the villain, then it is the sulphonamides and, later, the antibacterials that are the heroes of the TB story. By identifying a germ, Koch set in train the process that in due time produced the magic bullets to destroy that germ, and eliminate the disease. But the paradox is that TB was on the wane by the time the magic bullets arrived. It had been in steady - indeed, precipitate - decline since the 1840s, for reasons still argued over. 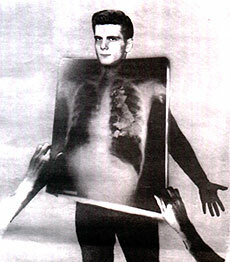 The historian Thomas McKeown has claimed that TB and other infectious diseases declined not as a result of medical interventions but in consequence of social and economic changes. "Effective clinical intervention came late in the history of the disease, and over the whole period of its decline the effect was small in relation to that of other influences," he said. Better nutrition was the key, according to this view. One could equally argue that the germ itself had changed, or that better public hygiene and the isolation of infective TB patients had made the difference. The fact remains that TB was on the way to being conquered before doctors had the weapons to which their victory is now attributed. Other nightmare diseases have seen a similar rise and fall in incidence: today the parallel is with heart disease, whose decline is difficult to explain by the dietary theories supposed to be its cause. Misunderstanding what put paid to TB is a major part of the problem we have with the disease today. The theory that drugs had conquered infection had only brief prominence, from about 1960 to the appearance of HIV infection in the early 1980s, but most of today's doctors took it in with their mothers' milk. What was overlooked was the germ's capacity to change in response to a new environment, and its ability to prey on those weakened by AIDS, poverty and neglect. To have ignored some of these things required averting the gaze from what has been going on in the Third World, but we are well practised in that art. It was much easier to see the rise of TB among the poor as the failure of governments to deliver the drugs needed to control it. Compliance - or the lack of it - became the World Health Organisation's watchword, its policy one of directly observed therapy, or standing over people making sure they took their pills. There is nothing wrong with this, as far as it goes. But curing even a standard case of TB requires compliance over many months, and drug-resistant TB is a tougher problem still. Multidrug-resistant TB (MDR-TB) can be treated, but only at huge cost. In New York, where valiant efforts have been made to get MDR-TB under control, management of a single case can cost US$250,000. In Russian prisons, where TB is rife, a fifth of all cases - some say two fifths - are estimated to be MDR-TB. Nor has the rise of TB left its old stamping ground untouched. The teeming slums of London in the 19th Century provided an ideal culture medium for multiplying TB. Today, London is much cleaner and less crowded, but TB infections are nevertheless on the rise once more. The rate of infection in Newham, at 100.6 per 100,000, is now greater than it is in Uzbekistan (94 per 100,000) or Azerbaijan (82). The whole of this increase can be accounted for by the poorest 30 per cent of society, especially those who live in crowded, ethnically diverse communities where immigration is a major source of new infection. The rich have as yet no need to fear TB as they once did, but the rise in cases has not yet elicited the kind of response in London that turned the tide in New York. Nor has basic protection against TB been stepped up. While cases have been rising, vaccination has fallen, from 742,000 in 2001-02 to only 450,000 in 2002-03. The risk of catching TB in the shires may still be very low, but there is little evidence of any concerted effort to keep it that way. Like doctors, ministers seem locked in a simplistic model of how TB was conquered, and persistently make public health a far lower priority than efforts to improve hospital care or deliver drugs. But the real lesson of TB is more profound than quibbling about whether the British government, or any overnment, is doing enough to deal with it. Rather, as Alimudden Zumla and Matthew Gandy argue in a new book, The Return of the White Plague, it is a question of explaining how a deadly disease that has a cheap and effective cure remains the leading cause of death and disability worldwide. This is, they insist, a medical failure. How can it be that in 1993, more than 50 years after the development of effective treatments, the World Health Organisation was forced to declare TB a global emergency? This is, said Charles Dickens, "a dread disease, in which the struggle between soul and body is so gradual, quiet and solemn, and the result so sure, that day by day and grain by grain the mortal part withers away, so that the spirit rows light and sanguine with its lightening load and, feeling immortality at hand, deems it but a new term of mortal life - a disease in which death takes the glow and hue of life, and life the gaunt and grisly form of death". That is the kind of prose we need to wake us to a threat that once sent thousands to die in Pan. We conquered TB once; now we need to do it again.